You know, sometimes incredible sandwiches are found through hours of research or recommendations from people in the know. But sometimes, amazing sandwiches present themselves to you by accident. Take for example, a recent visit to the Empire Center in Burbank. It was just a typical Saturday afternoon of visiting my local home improvement store and buying new socks from Target. You know, the stuff weekends are made of. In a break from shopping, I pondered the options for lunch. Many chain restaurants were begging for my business, but I had no desire to stop at any of them. 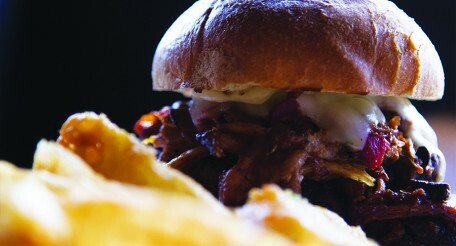 Out of the mess of mass produced foods, I noticed a small eatery called the Grain Lab. Intriguing name, surely, but was it an intriguing menu? 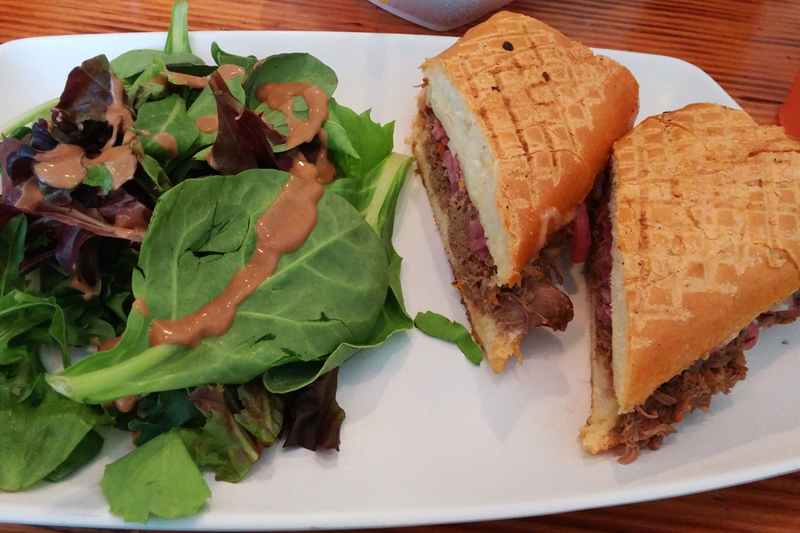 Everything offered on the regular menu sounded incredible, made with fresh ingredients, but it was the weekly special that really caught my eye: the Braised Beef sandwich. This lunchtime treat was packed with shredded beef with oven roasted tomato, horseradish aioli, pickled onions, and white cheddar cheese on a French roll. The beef w as so delicious. Seriously, it had a smooth savory flavor with an incredibly tender texture. The pickled onions added a bit of sweetness along with some sweetness from the beef. The horseradish aioli brought the contrasting bite while the melted white cheddar cheese added a creaminess to the sandwich. The French roll’s flavor was easily beaten out by its delicious interior, but that was just fine. With all of the amazing ingredients, I wouldn’t want the bread choice adding too much flavor and taking away from the amazing shredded beef. The Grain Lab is a perfect example of finding excellent sandwiches in any city where you least expect it. Nestled in between a number of different fast food chains is not the place anyone should expect to find a healthy eating option, with affordable prices, but lo and behold even your faithful Sandwichologist can be proven wrong from time to time. 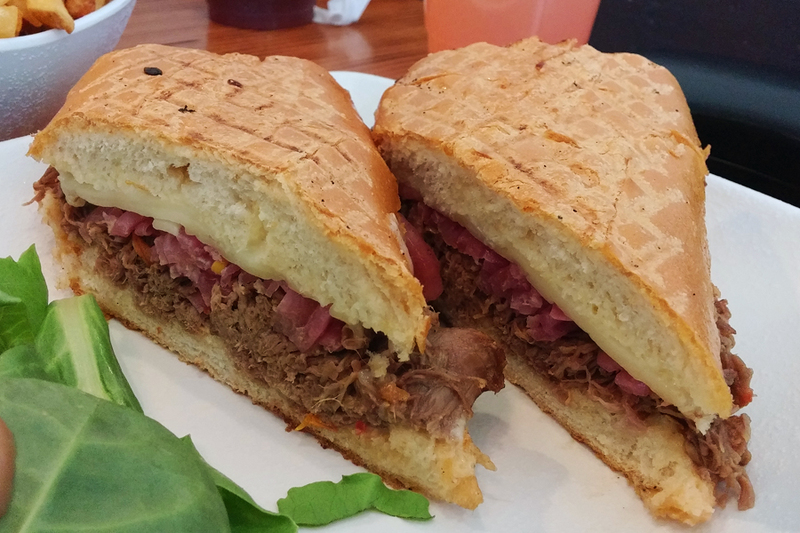 While the Braised Beef sandwich was only a weekly special, it is definitely a place I will be returning to so as to try some of their regular options, with better-than-regular flavor. Keep The Grain Lab in mind, even if you don’t live in Burbank as a perfect example of finding a hidden gem in your own neighborhood when you least expect it.